Anyone who is not a 13-year-old girl may be surprised to learn that there is an entire mini-industry built around teenage boys who have floppy hair and make YouTube and Vine videos about nothing in particular. The non-ironic, Internet-enabled version of Lisa Simpson’s Non-Threatening Boys Magazine, this subculture may seem to have limited appeal for just about anyone, yet it has managed to snowball into millions on millions of hits, not to mention actual real-world tours, which we assume just have the Vine stars in question stand on a stage making a “:-\” face at the audience and flipping their hair, occasionally punctuating the silence by saying, “That feel when you wake up and it’s a snow day,” before describing an animated GIF of Kermit The Frog being excited. Adding to the curiosity is the fact that every last one of these tween favorites seems to without exception have a Colton Burpo-style name that sounds like the first thing you would blurt out when coming up with a fake name to give the cops. 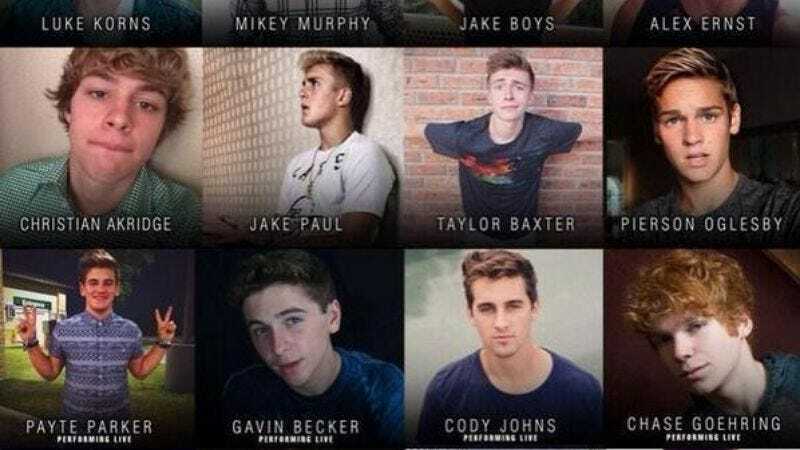 Examples from this one Vine/YouTube star tour lineup alone include Luke Korns, Jake Boys, and Joey Kidney. Enter the Vine Stars name generator, from Twitter user @leyawn. Like the Wu-Tang Clan rap name generator that gave Donald Glover the name “Childish Gambino,” the generator spawns seemingly endless permutations of Vine names ranging from the wholly plausible (Duncan Gregg) to the Steve Brule-esque (Gobungo Mmlurp). Despite its simplicity, the end result turns out to have considerably more replay value and amusement packed into it than a thousand “my reaction when mom says I have the house to myself this weekend” Vine videos.